Placing Renault and Nissan under a single umbrella could take place in two or three years, Ghosn says. Renault SA and Nissan Motor Co. are leaning toward establishing a holding company that would put the two companies under a single umbrella, Carlos Ghosn said. The process could take place in two or three years, Ghosn, who is CEO of Renault and Nissan, told the Nikkei business daily. 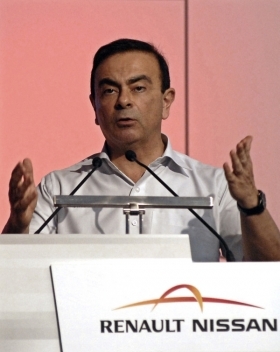 Ghosn said shareholders' interests must be taken into consideration, suggesting Nissan and Renault will remain listed and the French government, which owns a 15 percent stake in Renault, will have a say, according to the report. The plan calls for Russia's leading automaker AvtoVaz, which is 25 percent-owned by Renault, as well as Romania's Dacia and South Korea's Renault Samsung Motors - both subsidiaries of the French automaker - to move under the proposed umbrella, the paper said. Nissan sold a record 4.08 million vehicles worldwide in 2010, with Chinese sales hitting 1 million for the first time and surpassing figures for Japan and the United States, the Nikkei report said. Russia, India and Brazil are also key markets for Nissan, the paper said. Placing leading local firms under the group's umbrella would be advantageous in expanding local operations while reducing expenses for building factories and establishing sales networks, the daily said. Renault currently owns a 44 percent stake in its Japanese partner, while Nissan holds 15 percent of the French automaker's shares. Although the 12-year Franco-Japanese partnership is often viewed as a success story in an industry littered with botched tie-ups, Renault investors seem less than thrilled about it lately. On February 10, Ghosn unveiled a new six-year business plan for Renault, promising to generate more cash and profits to reward shareholders. To his surprise, investors gave it the thumbs-down. Investors were mostly unhappy that Ghosn had failed to address one of their biggest gripes: the financial structure of the Renault-Nissan alliance. It is a complicated structure. Renault has $20 billion of its capital in its 44 percent share in Nissan. That exceeds Renault's own market capitalization of $18 billion. If the point was to have a partnership that the two sides could benefit from, Renault could do it with a smaller stake in Nissan and put the cash to better use, the investors argued. "It's a fair challenge," Ghosn told Reuters last month in his 21st floor corner office at Nissan's global headquarters in the Japanese port city of Yokohama.